Cornelius Agrippa Badmonk (name derived from the German magician, occultist and alchemist, Heinrich Cornelius Agrippa, born in 1486), is often referred to by ape scholars as the “John the Baptist of the Apes,” because he was the first super-intelligent ape to walk among men. Unfortunately, it was another 40 years before more intelligent apes walked the earth, and poor Cornelius was all alone in his crusade to conquer the human race. His feeble attempts were often laughed at and jeered by homo sapiens, who thought Cornelius was simply an actor in an ape mask. 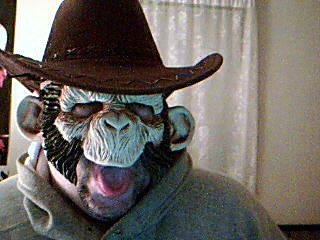 When the apes finally took over, Cornelius was finally taken seriously. Now he was an elder among his people and considered a true Ape pioneer. Using time travel (also developed by intelligent apes), Cornelius has made of hobby out of going back in time and taunting the very humans who had laughed at him years before. Appearances: Cornelius first appeared before humans at the WORLD HORROR CONVENTION in 2005, in New York City, where he was one of the competitors in the so-called “Gross Out Contest.” While many people booed his performance, where he taunted both the audience and the judges – calling them “filthy humans” – there were some people who actually understood his message. Word of mouth followed. Something was in the air. He also did a reading and sang with the house band (a rendition of “Yummy Yummy Yummy, I’ve Got Love In My Tummy”) at the first annual KILLERCON in Las Vegas in September 2009. Cornelius can be seen regularly as the “wise-cracking co-host” on the internet TV program LAIR OF THE YAK, aired on www.blogstar.com on Saturday nights at 9pm EST. His books include: 101 WAYS TO COOK HUMAN MEAT, THE DAY MANKIND PERISHED, and the popular “Monkey” Rogers mystery series written in “collaboration” with his cat, Mr. Snuggley-Poo. Wise-cracking apes should be sent back to the future where they belong! Oh Lisa and Laura! The first time you guys drop by and it’s Cornelius Badmonk day! 😛 I’m happy to see you. I enjoy your blog. K – I’m bettin’ on the monkey. Dear Mercedes, thank you so much for promoting the Ape Cause. In the future, I promise not to torture you too much. And btw, that is not a mask. That is my real face! Nice to see Lord Cornelius here.